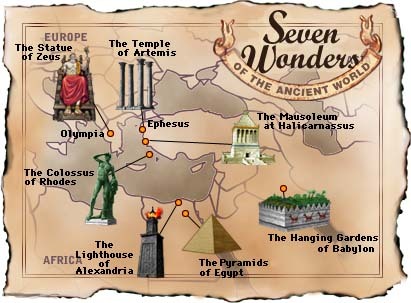 (CNN) -- Can you name the Seven Wonders of the Ancient World? Don't panic if you can't. With modern monuments, the Seven Wonders of the Middle Ages, and the world's Seven Natural Wonders in the mix, very few people can sort out these astounding ancient architectural feats. What makes it even harder is that only one still exists. Inspired by mythology, religion and art, ancient civilizations undertook these seven imposing projects from about 2700 B.C. to about 270 B.C. Only one, the Egyptian Pyramids at Giza, has survived. Fires, earthquakes, conquests and the ravages of time have led to the others' demise. The ancient Greeks and Romans are said to have initiated the original "Seven Wonders" list, perhaps as an early travel guide of sorts. Over time, the inventory was added to and culled, then finally "completed" during the Middle Ages. Classical writers later disagreed on the final list, but the following seven works of art and architecture were among those most commonly included. Unfortunately, relatively few drawings or sketches exist of the wonders that vanished, so archaeologists have relied on ancient tales and literary works to get an idea of their appearance and history.